Most patients are anxious before undergoing an MRI exam. They’re sick, injured, or worried about their test results to begin with, and their anxiety levels often increase when they’re placed in a loud MRI tube, according to Hausmann. Patients also may have trouble hearing the imaging staff administering the exam, which can interfere with image quality and results. 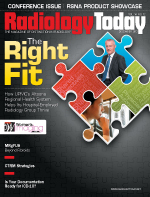 Consequently, radiology manufacturers are seeking ways to improve their MRI systems and make the experience as quiet as possible. With the goal of mitigating these problems in the imaging room, GE Healthcare recently released Silent Scan, a combination of Silenz technology, high-fidelity gradient and radio-frequency system electronics, and fast radio-frequency switching capabilities. The main source of MR noise results from the gradient magnetic field, which creates mechanical vibrations by rapidly switching on and off with data acquisitions. The Silenz technology continuously acquires data from gradients, eliminating the repeated switching on and off and the vibrations. The high-fidelity gradient system allows for stable gradients, and the radio-frequency coil system’s fast capabilities allow the coil to switch from transmit to receive mode in lieu of switching gradients. Currently, the technology is available only in T1 and proton density–weighted scans at 1.5T, but GE hopes to make Silent Scan available to its 3T systems in the near future. GE is not the only manufacturer to pursue noise reduction advancements for its MRI systems. Suresh Narayan, senior manager of market development for Toshiba’s MR business unit, says the company has been implementing noise reduction technology for several years. Toshiba’s Vantage MRI systems come standard with Pianissimo technology, which seals the gradient coil in a vacuum chamber. The company claims Pianissimo can reduce the noise by 90%. Stuart Clarkson, senior director of Siemens Healthcare’s MR business unit, says there are many ways to reduce the noise level in MRI systems. “We actually included a lot of hardware that can mitigate noise, such as mounting in the gradient coil that will help suppress that noise and to mitigate the movement of the coil,” he explains. While these manufacturers have found different ways to mitigate MRI-related noise, they all agree that the end product has improved the patient experience, especially for those requiring long exams. Noise reduction technology enables patients to hear the technologist or family members inside the scan room—significant comforts during a sometimes-stressful procedure. Narayan and Clarkson say some patients choose to wear headphones but not because they want to reduce the loud noises associated with conventional scans. Patients can bring in their iPod or CDs to listen to while they are being scanned, swapping out the old “jackhammer” noise for their favorite songs.